Is it possible to add or choose nested sub-folders with Google Drive integration? 2. Is it possible to add more sub-folders with Google Drive integration? I will have quite a bit of folders on a root level if I can't create more sub-folders. 3. I noticed that I can use Jotform Google Drive App to create sub-folders on a Google Drive. That's great! How can I choose how folder will be named? When it comes to choosing the name of the sub-folder, are you still referring to the Google Drive integration, or to the app that allows you to create forms from the Drive? 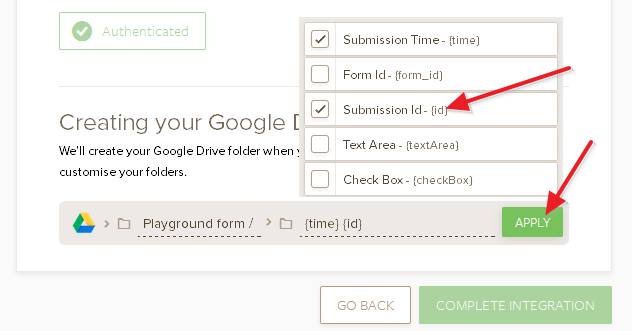 If you want to change the name of the Submission folders (the individual folders of each submission), you can control their names when you are still setting up the Google Drive integration. If you were referring to something else, please add a bit more information about what it is you meant exactly, and we'll be happy to help.